If you have placed an order with us in the past, your information is already in our system. To place a new order, simply enter your username and the password that you previously created for Newsmax. You are not yet signed in. Sign in now! Sarah Palin is one of the most controversial and exciting figures on the political stage. She is hated and feared by her liberal detractors. Conservatives love her. Her story has never really been fully told — until now. From her humble beginnings to her time in the spotlight as the first female Republican vice presidential candidate, Sarah Palin has led an extraordinary life. Going Rogue will recount her shocking rise from housewife to governor of the state of Alaska — and how she took on a corrupt political establishment to win the state's highest office. Going Rogue will tell for the first time why John McCain selected her and what really happened during the 2008 campaign. In Going Rogue, Sarah Palin holds nothing back and even gives her stunning assessment of Barack Obama. 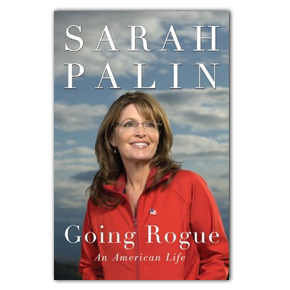 And in Going Rogue, you will discover the personal side of one of America's most fascinating women. Sarah shares how faith has led her throughout her life and offers her insights into the personal challenges she's faced — including balancing her time as a working mother, recognizing the war's impact with her son serving combat in Iraq, having a child with a disability, and supporting her teenage daughter through an unplanned pregnancy. The media have gone out of their way to distort and twist the real Sarah Palin. In Going Rogue you will get to see her close up and real — and find out what the media simply don't want you to know. Palin has received much attention through the media, but never before has her complete story been told in her own words. Going Rogue does just that.